While speaking Tuesday in Chicago pandering to Hispanics and discussing his recent executive order regarding amnesty for illegal immigrants, President Barack Obama went off script and actually spoke the truth. Obama stated to the hecklers, “I just took an action to change the law”. It was only last week that the White House was defending Obama’s Unconstitutional executive amnesty order as making changes within the existing law. Hmm, it sounds like he just admitted that he “took an action to change a law, PERIOD! Obama so wanted to be liked by the crowd and garner their cheers and adulation that he spoke the truth. Too bad he had no Constitutional right to do so. To hell with the separation of powers. “All right, OK. OK. I understand,” Obama told the protesters after letting them go on for some time. “Listen. Hold on, hold on, hold on. Young lady, young lady, don’t just — don’t just start — don’t just start yelling, young ladies. Sir, why don’t you sit down, too? “Listen, you know — here. Can I just say this, all right? I’ve listened to you. I heard you. I heard you. I heard you. All right? Now I have been respectful, I let you holler. All right? So let me just — nobody is removing you. I have heard you, but you have got to listen to me, too. All right? And I understand you may disagree, I understand you may disagree. But we have got to be able to talk honestly about these issues, all right? Barack Obama Flubs the Spelling of “Rspect”, Oops “Respect” While Praising Aretha Franklin, the Queen of Soul … Obama Got Swag, Really? Teleprompter reading mishap alert … Anurag Kashyap has nothing to fear from President Barack Obama. Hmm, the president who does not know how many states there are in the United States, also appears to have no clue how to spell the word respect. Barack Obama misspelled the word “respect” while giving praise to Aretha Franklin at a tribute to the Queen of Soul. Obama managed to spell it “R-S-P-E-C-T.” Are you kidding me, Really? This brought to us by the most intelligent, smartest president ever with an IQ off the chart, or so they say. Who find else finds it telling that Obama can’t spell the word respect? The media and late night comedy shows HERE and HERE crucified John Travolta for botching the name of Idina Menzel at the Oscars, but where are they with Obama’s screw up? Oh that dreaded “E”. But of course there is no media bias. Just ask former VP Dan Quayle how the media dealt with him with his extra added “E”. No wonder he has never released his college transcripts. I had asked above, “Who find else finds it telling that Obama can’t spell the word respect?” It would appear one person who did was of all people was the NY Times Maureen Dowd. Barack Obama most certainly does have a “Swag” and “respect” problem. However, Patti LaBelle seems to think BO’s got Swag. YIKES, let’s hope that Patti does not mean the urban dictionary version. I thing she meant “SWAGG”. In any event, it would seem that Obama does not know how to spell respect, and LaBelle does not know what the definition of Swagg is. President Obama pulled a Quayle Thursday night at a White House performance by the women of soul and muffed the title of Aretha Franklin’s anthem. “R-S-P-E-C-T,” he said, looking a bit confused and eliciting laughter. Swag and respect are exactly what the president needs. He’s got a swag gap with Russia. His administration, after belatedly figuring out what was going on in Ukraine, is improvising as the uber-swaggering Vladimir Putin once more rolls in with tanks anywhere he likes. HOPE & CHANGE … Well now we know what Barack Obama’s master plan was in getting the job as president of the United States. It was a resume builder for his dream job, to be a host at ESPN’s Sports Center. 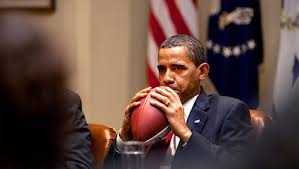 As stated at Hot Air, now it makes sense why Obama has devoted so much time and effort to March Madness brackets, the Super Bowl, and the World Series for the last five years “while casually mucking up giant parts of his day job” as president. I say, why wait? Please just quit now and go to ESPN, please! Although I will also sadly say that he is probably more qualified to be an ESPN host than he is president. I guess we now know why he takes the job so seriously. If you have any doubt as to how much of a sports junkie Barack Obama is, check in with the entertainment moguls who attended a private briefing with the president Nov. 26 before his speech at Jeffrey Katzenberg’s DreamWorks Animation campus in Glendale. At the end of the conversation — which touched on a myriad of topics, from piracy to Iran — Obama revealed what’s at the top of his bucket list post-White House: “At least I know what I want to do when I retire … host ESPN SportsCenter’s Top 10 list,” Obama quipped as he turned to Disney’s Robert Iger, whose empire includes ESPN. Weasel Zippers some what agrees, “Well, he is an expert at reading off a teleprompter”. However, I would remind all as I did intern for a short period of time at a news outlet that everything is not provided to hosts on a teleprompter. Many times a producer is talking in your ear and you have to ad-lib. I would suggest that Barack Obama nt use the video below as his audition tape. Yesterday, while trying to hide from the three scandals that plague his presidency, at a speech in New Jersey (photo-op), President Barack Obama told a New Jersey crowd that the government would be there for the “folks in Monroe, Oklahoma after the devastation of last week.” His exact words were, “We’ll Be There for Folks of Monroe, Oklahoma.” How nice that he would remember the people of Monroe, OK, just two days after he visited the disastrous devastation following the tornadoes that ripped through leaving death and destruction in its wake. WHAT? Wait a minute, did Obama say MONROE? You mean Monroe, OK was hit by an F5 tornado too? Obama, the Consoler in Chief who pretends to care actually got the city wrong. ITS MOORE, OKLAHOMA YOU IDIOT!!! How on Earth, just two days after you visited MOORE, OK do you forget the name of the town that was just devastated by an F5 tornado? Seriously, do you care so little? Did it have so little of an impact on you that it took you just two days to forget? I mean really, you can see that Obama is using teleprompters which means he is looking at the words Moore, Oklahoma and still saying Monroe. UNREAL!! !